Over the weekend I read an article about a 60 minutes episode about Cook County Jail and Sheriff Tom Dart. Cook County Sheriff Tom Dart is in charge of running Cook County Jail, the largest single-site jail in the United States. After I finished reading the article, I was struck by some of the information contained in the article and wanted to pass along some of the things that I learned. We are used to seeing news stories about inmates who are released from prison after spending years behind bars for a crime they did not commit. We become conditioned to believe that this is all that is wrong with our criminal justice system. But this article about Cook County jail is much more disturbing because it represents a systematic injustice, legal and moral, with our criminal justice system. The current jail population at Cook County Jail is approximately 7,500 prisoners a day. Roughly 70,000 inmates a year pass through Cook County Jail. A very large portion of the inmates who enter Cook County Jail stay there because they are unable to come up with the bond money needed to be released from jail. Many times, the amount of money needed for them to get out of jail is very small. It could be as little as $100, but because they don’t have the money to post the bond, they cannot get out of jail. The overwhelming majority of the inmates who have a low bond pose little or no danger to society. They are there because they were caught with a small amount of drugs or because they tried to steal something from a store. Meanwhile the people that pose a danger to society, like gang members who are caught with illegal guns, are able to post bond because their gang puts up the money and they are out on the street. A troubling statistic from this article is that last year, 1,024 inmates spent their entire prison term in Cook County Jail. While that is troubling, in and of itself, the following statistic is shocking. An equal number of inmates spent an extra 222 years in custody in Cook County Jail. It would be understandable if this was because the inmates were violent or posed a danger to society. But keep in mind that a large percentage of the inmates in Cook County Jail are there because they cannot afford to post low bonds. If somebody has a low bond it is probably because what they are being charged with is a minor offense and they have little or no criminal background. This is a very troubling statistic. The next issue has to do with the mental health issues surrounding Cook County Jail. In 2012, the City of Chicago closed down half of it’s mental health facilities. By then, Cook County Jail was already one of the largest provider of mental health services in the country. Since then, Cook County Jail has become one of the largest mental health facilities in the world. Roughly one-third of the jail population suffers from a mental illness. Sheriff Tom Dart is focusing his attention and resources on providing mental health treatment to his inmates. 60% of the jail corrections officers have advanced mental health training. He has named a 39 year old psychologist to be the Warden of the jail. The mental health treatment needs of prisoners has become such a big issue that he has chosen a psychologist to run the day to day operations of the jail. The Sheriff’s emphasis on providing mental health treatment for inmates has caused friction between jail employees and the Sheriff. There have been incidents of violence between inmates with mental problems and jail employees. Jail employees have accused Sheriff Dart of siding with inmates over jail guards. They accuse him of being too soft on inmates. Last year Sheriff Dart released a video about how hard life is behind bars. That video showed jail employees beating inmates. When a society shuts down half of it’s mental health treatment centers and then stands by and watches the mentally ill among us fill the county jail, there is something wrong with that society. A society that is willing to spend money on locking up the mentally ill, but unwilling to spend money to treat the mentally ill before they become locked up, is an unjust society. Dumping the mentally sick and the poor in jail is not how a society should treat the weakest of its members. And who are the victims of the violence and the crimes committed by the mentally ill? The taxpayers who pay to house them in county jail and provide the medical treatment in jail. It’s a process that makes no sense and is just plain wrong. The problems with our criminal justice system are much more than just confined to the criminal justice system. We need to look at our priorities and our values as a society. We should look inward and decide what type of a society do we want to be. 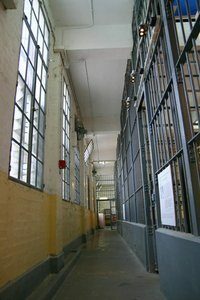 A just and fair society should not allow it’s jails to become the dumping ground for it’s poor and mentally ill.
James G. Dimeas is a nationally-recognized, award-winning criminal defense lawyer who has spent over 25 years handling criminal cases throughout Chicago, Cook County, DuPage County, and Lake County. James Dimeas has been named a “Best Criminal Defense Lawyer in Chicago” by Expertise and a “Best DUI Attorney.” The National Trial Lawyers have named Mr. Dimeas a “Top 100 Criminal Defense Trial Lawyer.” The American Institute of Criminal Law Attorneys have named James Dimeas a “10 Best Attorney for Client Satisfaction.” The American Society of Legal Advocates have named James Dimeas a “2018 Top 100 Lawyer.” AVVO rates James Dimeas as “Superb”, the highest rating possible for any lawyer in the United States. If you are facing criminal charges you can always contact criminal defense lawyer, James Dimeas, for a free and confidential consultation. You can always speak to James Dimeas by calling him at 847-807-7405. Half of the Inmates Shouldn’t Be Here, Says Sheriff Tom Dart, Correspondent Lesley Stahl, cbsnews.com, 2017. What Rights Do You Have if You Are Charged With a DUI?, by James G. Dimeas, Chicago Criminal Lawyer Blog, April 18, 2017.